For lovers of seafood and all things nautical, here is a guide to the region surrounding the Bassin de Thau, an inland salt lagoon linking the Canal du Midi to the Rhône-Sète Canal, and the setting for the Hérault’s famous production of seafood. To help you plan your exploration of the area we have a brief introduction to some of the villages. 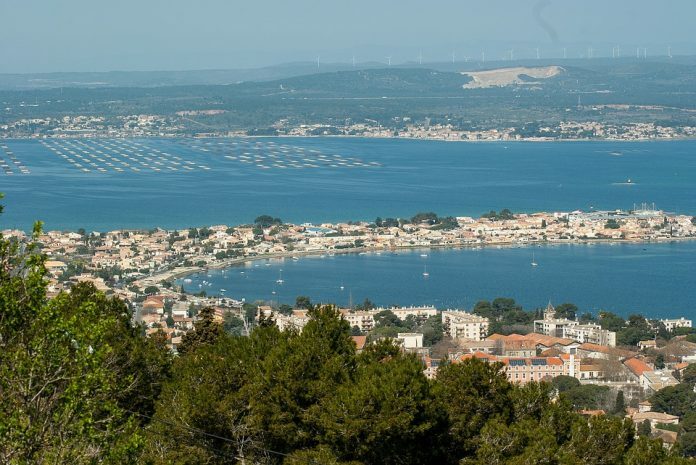 Sitting on the edge of the Etang de Thau between Sète and Mèze, Balaruc is famous for its spa centres, where you can indulge in pampering treatments or follow a health-oriented programme. Cradle of shellfish farming, with an economy based on the salt lagoon of the Etang de Thau, this quiet fishing village on the edge of the lagoon is a favourite destination for seafood lovers. You will find a large choice of restaraunts and cafés in which to try local oysters. The village, with its narrow lanes, is very active and proud of its status as a “Ville de Goût” or Town of Taste. The legend goes that during the second war against Rome, the General Hannibal(247-183 BC), passed near to the village on his way to Italy surrounded by his armies and elephants. One of his lieutenants is rumoured to have suggested a stop in the village to enable the troops to drink at the spring of the Théron. Hannibal is rumoured to have replied “Curnon” (why not? in Latin). The ending “Terral” means “land beaten by the North-West wind”. The first written mention of “Cournonterral” was in 1025 in the Charter of 2 November as a “castrum” or “castellum”. Set in the middle of vineyards and garrigue, with a view of the Etang de Thau, Loupian served as a stopping point for travelers in the Middle Ages. There are numerous remains dating from this period. A Roman villa can also be visited just outside the village, a luxurious house with mosaic pavings (dating to 2nd and 5th century) that formed part of a large agricultural property. It is classed as a historic monument. The village has many picturesque streets and medieval squares, and plenty of opportunity to taste local specialities and wines. With an exceptionally pretty setting on the edge of the Mediterranean Sea and the Etang de Thau as well as the Canal du Midi, Marseillan is an attractive port that draws many visitors each year. It has retained the charm of its old village but offers plenty of beach-resort fun on its beachside at Marseillan-Plage, with streets lined with holiday shops and eateries, which, however, empty in September. Come to Marseillan for a choice of activity and a real taste of the Mediterranean. Sitting on the edge of the Etang de Thau, this village will charm you with its narrow streets, unspoilt, and its small square fishing harbour surrounded by seafood cafés, a perfect place to take lunch. The Etang is an inland lagoon that joins the Canal du Midi to the Canal du Rhône à Sète. With a strong tradition of seafood cultivation and vine growing, the village preserves its heritage carefully. Discover the legend of the carnival ‘cow’, their jousting events in the summer, or the sport of ‘tambourin’. Situated between the hills of Moure and the Roman road, the village has witnessed a lot of history over the years, evidenced by the beautiful frescos of Christ surrounded by the apostles in the Chapelle St Pierre, dating to the 12th and 13th century. Now boasting only 2240 inhabitants, the village is picturesque and full of attractive stone houses. Its lanes date to the Middle Ages and reveal the presence of a strong bourgeoisie. Of particular interest are the houses of the vine growers (hôtels particuliers), chapelle Saint-Pierre (12th century), mediaeval castle. Many old gateways and churches and old buildings. The Colonnade, a line of columns, marks the position of the last chateau built by Lord Lavergne, who decided to have it built where he could get a good view, rather than in the centre of the village. The columns used to open onto a huge park that led down to the river. A typical wine-producing village, close to the attractions of the sea and also the inland countryside. Surrounded by vines, Pomérols has preserved its heritage, traditions and gastronomy. Here you can taste the famous Picpoul wine, locally made chocolates and renowned charcuterie. The village is beautiful and boasts many old houses dating from the fourteenth, fifteenth and sixteenth centuries. The church St-Cyr and Ste-Julite-de Pomérols dating from the thirteenth century; the latter holds a baroque artefact in sculpted wood with gilt, from the eighteenth century and is classed an historic monument. You will also enjoy the old centre with tiny streets and alleyways, squares and fountains. The first written record of Poussan was in the year 960. Around the eleventh century the town formed around the castles: Montlaur, dating to the 12th century, Malbois in the 16th century and Garenne in the 17th century. Poussan is a circulade village, built in a circular form as a defense measure (see our article on circulade villages. Set in the garrigue and rich in history and heritage, with capitelles (small stone huts) to visit and vineyards to discover. Nearby, the cistercian Abbaye de Valmagne takes you back to the high point of the 12th century for this area. It also boasts a medicinal garden, replanted according to monastery plans.